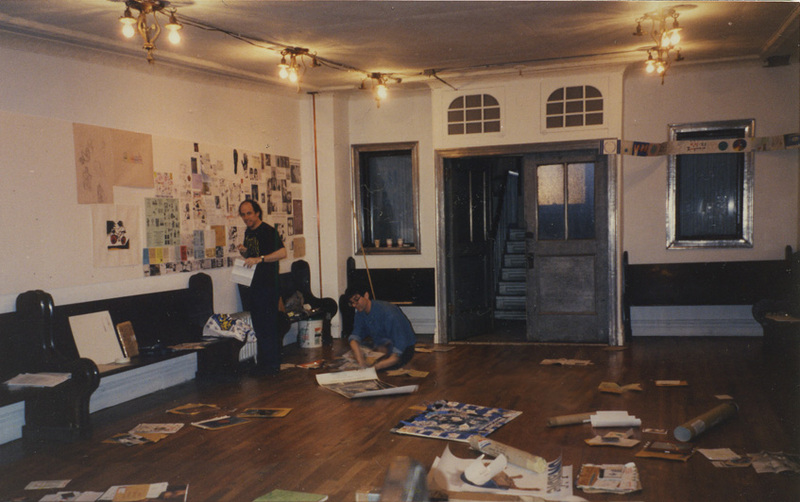 THE ONE WORLD POSTAL ART SHOW opened June 6, 1996 and remained on view at The Synagogue Space For Visual and Performing Arts at 108 East First Street across from Katz's Deli on the Lower East Side of Manhattan, NYC, USA THROUGH JULY 6, 1996. The physical show is over now but it lives in this cyberspace exhibition which continues to grow as a work in progress. 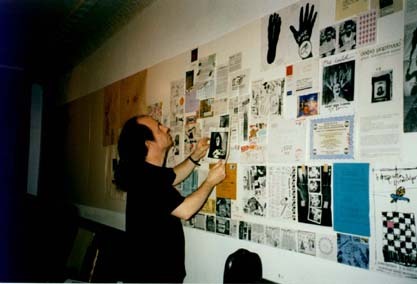 THE ONE WORLD POSTAL ART SHOW was one of the very first mail art shows to be documented on the Internet. See pictures from the opening of the One World Postal Art Show. See photos of the show via maps of the One World Postal Art Show. See closeups of the art that made up the One World Postal Art Show. See the address list of participants. Read the welcoming statement to the One World Postal Art Show. Read a letter to the United Nations proposing the One World Postal Art Show early in the process. See 2nd, 3rd, 4th and 5th grader's art and high school student's art on the themes of the One World Postal Art Show. Read about the history of mail art. It was a beautiful evening for an opening. Many people attended- both mail artists and people who had never heard of it. A good time was had by all. As one walked into the 70 year old building, one was immediatley confronted with "Superpower Mail Bags," a piece by me, curator Mark Bloch. Cold War period Chinese and Russian mail sacks flanked an American mail bag in the center of the foyer. Stretched across the room just out of reach was a piece by Iowa's "Fluxus Midwest" contingent- "One World, Two Wing Nuts." Next one could ascend one of two stairs. To the left were 100 pieces by the students of local elementary school PS 97. To the right were some enlarged letters to and from the United Nations. 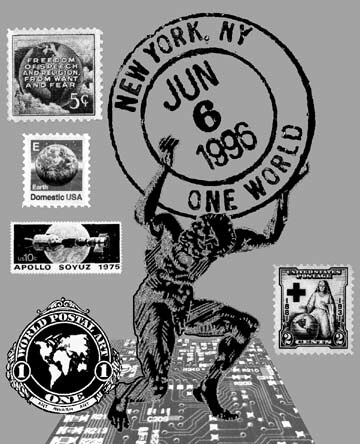 This show was previously called the United Nations One World Postal Art Show. For many reasons, including a complete lack of cooperation by the United Nations, the words United Nations had been dropped from the show's title. The original idea was to celebrate the UN's 50th anniversary last October and show the similarities between the altruistic UN charter and mail art, an activity that has taken place since the early 1960's and alot longer if you want to count the time Cleopatra had herself wrapped in a blanket and delivered to Caesar. Anyway, when you get to the top of the stairs you see an entire room packed to the gills with mail art from all over the world. The show was well recieved and the electronic component will appear HERE so stay tuned and you can experience it for yourself. Video clips from the opening and a complete catalogue of all the participants in the show appear here. I was glad to welcome old friends John Evans, Barbara Moore, EF Higgins III and others from the mail art world of NYC and surprised to see Turk Le Clair, a correspondent of mine since the late 70s who showed up from California. I also met for the first time newcomers to mail art Dragonfly Dream and the Sticker Dude, Joel Cohen. I was assisted in hanging the show by my friends Peter Brill and Tom Little who helped me put up foam core around the perimeter of the main room to hold the work and protect the walls of the synagogue. Then Jim Quinlan (right) and John Evans showed up to help me sort through the work and pin it up on the foamcore. Interestingly, the curators of the space were not in favor of the show when they saw the process halfway through and I told them, yes, I wanted to hang all the envelopes as well as what was sent in them. So I made some changes and hung it anyway despite their protestations and threats to pull the show. In the end I think it turned out well and their feedback was even valuable in some ways. They were concerned that the audience they expected would not be able to understand the experimental nature of mail art. I made sure to include lots of descriptive signs which you can see in these pictures of the exhibition.